One of the best and most reliable payment systems currently used by popular marketplaces in the world is PayPal. It also happens to be a popular payment method of choice among web hosting providers like iPage, thus enhancing the web hosting experience of their clients, as well as potential customers. iPage is one of the most popular web hosting companies out there; providing high-quality hosting solutions at a reasonable price. The company is always one of the top ten most reliable web hosting providers in multiple web hosting review websites. In fact, it may just be the leading web hosting provider out there, since it has already been in the web hosting business for more than a decade, resulting in millions of websites already being hosted by the company. With plenty of positive feedback from current account holders and customers, iPage is one of the top choices when it comes to web hosting, attracting even more people to sign up and create new websites. What are the benefits of hosting your website with iPage? iPage even offers additional promotional discounts such as the 70% off from the iPage registration fee. 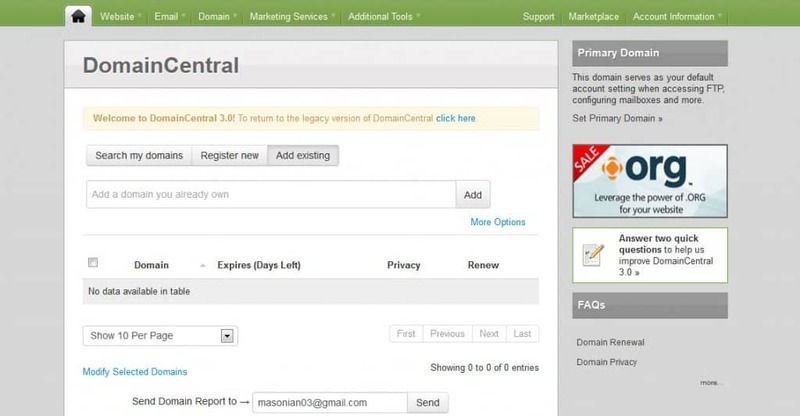 Besides these, iPage also lets you use DomainCentral to help you easily manage and control all of your existing domains in just a single web host provider. How cool is that? iPage guarantees an uptime rate of 99.9% since they use multiple advanced servers to boost the speed and improve the reliability of the web hosting. For those who are faced with technical issues, it’s good to know that you can easily and quickly get in touch with the customer support team, with an average hold time of only two minutes. This further enhances the reputation of the company as being one of the best in terms of customer support. Is PayPal your preferred method of payment? You’ll be glad to know that iPage supports PayPal so you can use it to pay for their web hosting services! PayPal is known to be one of the best, safest, and most trusted payment systems when it comes to online banking. This can be seen in the continued use not just by iPage but also by other web hosting companies. Site owners and iPage account holders can also hide their credit information under PayPal. This is to ensure that your credit information is kept safe and secure, especially when the use of credit cards is believed to increase the danger of unknown persons acquiring sensitive information. recurring fees from your registered PayPal account. You will only be able to see the deductions when you check your PayPal transactions on a regular basis. Choosing PayPal as your preferred iPage payment method is easy and can be done in just a matter of seconds. All you need to do is to sign up with iPage by clicking the Sign Up Now button. The new page will reveal domain selection choices. Your chosen domain name can be an existing one or a new one. This can be done by ticking the appropriate check box before you click on the Continue button. Once you’re done, you will be directed to the billing information page where you need to fill in personal information, including your real name, email address, and contact number. In this page, you will also be able to find the Payment Information panel, but under a different heading. The payment choice include PayPal, Visa, MasterCard, American Express, and Discover. Once you’ve picked PayPal (or any other payment method) and filled in the necessary signup details, click on the Check Out button to finish the domain registration. You’re good to go!